How can you create a structure for your day when you work for yourself or have a crazy schedule? When we were children, our entire day was planned for once from the moment we woke up to when we had bedtime. As adults, it can be difficult to follow a set routine. From entrepreneurs to stay-at-home parents to everyone else in between with crazy schedules, we're giving our top 11 tips on how to bring more structure to your life so that your health and fitness can improve and thrive. How can a structured lifestyle improve your day? By having a set plan, you can free up time so that you can focus on the important factors in your life. If you ever need extra help to improve your lifestyle to make time for you and your health, you can always turn to Devon and I or join our Open Sky Fitness Podcast group to connect with other people who are in the same scenario as you. BONUS! Get Rob's Open Sky Fitness Recipe at the end of this blog post! Are you making healthy decisions for you and if so, where did you learn them? Did you learn it by yourself or from your parents and observing their schedules? Are you following a similar structure to what your parents have or are you changing it to match your own? Don't start your day by putting out fires i.e. checking your phone, sending emails, or wasting time on Facebook. If you exercise in the morning, not only will it help energize you, but you'll also be able to get it out of the way before doing anything else. That in itself will help you feel good about yourself . Next, you can focus on other important tasks at hand. Get a better perspective on something by taking a break. Go out for a walk and take your mind off of things. Don't pressure yourself when you don't feel like you have enough time to really do what you need to do. Plan your day out to give yourself a break. If you going to have a good priority, you have to ask yourself, "What you want and why do you want it? Why is it so important to you?" Start your day off on the right foot with some coffee that will last you all morning so that you don't feel like you need to keep drinking more and more of it to stay energized. Each morning, I blend the following ingredients with a blender such as the Magic Bullet or Nutri Bullet. That's right! We have a closed Open Sky Fitness Podcast group on Facebook where you and everyone have the opportunity to talk about your health and fitness goals in a safe environment. We post workouts and start discussions about how to be strategic around finding a healthier you. Check it out! 7:30 How can you create a structure for your day when you work for yourself or have a crazy schedule? 17:10 Where are you now? Questions to ask yourself. 22:40 How to structure your morning. 39:00 Eat the frog: Completing the most difficult task or project on hand. 53:00 Skip the caffeine and do something else! 1:02:10 Get help when you need it. Thanks for listening/reading Episode 164 - 11 Ways to Create Structure for a Crazy Schedule! We hope you have gained more knowledge on how to be a healthier you. Gut health is a hot topic in the health and wellness industry right now so who better to turn to then Dr. Michael Ruscio himself! This is Dr. Ruscio's second time on the Open Sky Fitness Podcast and he had so much great information to share with us and answered a ton of questions from our Open Sky Fitness Podcast group on Facebook. Dr. Ruscio is a Functional Medicine Practitioner and the Lead researcher in current IBS study. He's also the host of his own podcast, Dr. Ruscio Radio and will be publishing a book on gut health later this year! Before we get into our interview, Devon and I took some time to talk about which foods and drinks can cause us to feel drowsy and crash soon after consuming them. Some you might expect, but otherwise could surprise you! We'll list the foods and drinks at the end of this blog post. According to Dr. Ruscio, if you're already healthy and following a healthy lifestyle, digging deep and doing an investigation on your gut health is logical, good place to start to get to the next level of wellness. How so? Because so many problems are caused by poor gut health. So, by focusing on the gut, you can get to the root of so many different problems. People who are overweight, depressed, have insomnia, or have Celiac disease can be possible candidates for SIBO. What Triggers an Autoimmune Disease? An autoimmune disease is defined as a disease in which the body's immune system attacks healthy cells. Autoimmune diseases range from Hashimoto's and hypothyroidism to rheumatoid arthritis, Celiac, and Crohn's Disease. If not treated, an autoimmune disease can lead to skin conditions such as eczema and psoriasis as well as depression or damage the brain's health. An autoimmune disease can be triggered by several factors. Many autoimmune diseases develop because of early life factors such as genetics or a person's environment. Was someone born via a C-section or vaginal birth? Were they breastfed or given formula as a baby? Did they grow up in a hygienic city or at a farm or in a large city with lots of pollution? Before seeking out professional help, you may be able to do some experimentation with diet lifestyle factors on your own. If you're not seeing any signs of improvement, then go visit someone who can help you. Alternative providers are good at prevention and getting to the root cause, but not necessarily when it comes to screening major health concerns and providing patients with the medicine that they need to heal. We shouldn't ignore conventional medicine when we need it for early detection and management of disease. See both as well as a functional medicine provider. Look for a general practitioner who has an open, objective mind to alternative medicine and won't just regard it as something bogus. Like highly addictive drugs, sugars give you a spike of energy and then you crash afterwards. While we're consuming it, we feel amazing, but then we just end up crashing and feeling worse than before grabbing that piece of candy or smoothie from Jamba Juice. Why are fruit smoothies juices so bad for us? Because we're just getting the sugars and not the actual fiber. If you do a vegetable juice, make sure it's celery or cucumber based juice. If it tastes super sweet, it's probably not good for you. You can add lemon juice or ginger to give vegetable juices a tasty flavor. Of all coffee and caffeinated drinks, energy drinks like Red Bull and Monster are the worst. They have different chemicals that are used to trigger caffeinated response that pump your adrenals until you feel like you have no energy left. If you're going to drink coffee, then try to add coconut oil or drink Bulletproof coffee so that you don't have a huge spike of energy, it's easier to digest, and experience a natural energy lift for a longer period of time. Adding dairy or drinking coffee with a meal can also slow down the side effects of coffee. Fat-free yogurts have 35g of sugar and cooked down fruits lose their nutrients. The more processed the oatmeal is like instant oatmeal, the worse it is for your body. Bananas can make us feel sluggish because of the magnesium and then hungry again with it's high sugar value. Cherries with the pits have tons of melatonin so they're great for a bedtime snack! 1:30 Check out last week's episode - OSF 162 - Barefoot vs Arch Support Shoes: Which One is Better? 5:30 Why do certain foods make us tired? 27:45 Why should we focus on gut health? 35:00 Signs of developing Crohn's Disease and whether we can avoid them or not. 39:30 Can we diagnose ourselves? How do we heal? 42:00 Should the first step for people be to go see a general physician? What should they do when they start noticing symptoms? 56:40 What happens during a SIBO breath test for Small Intestine Bacterial Overgrowth? 1:00:20 If you suspect yourself of having SIBO, but you've changed your lifestyle, is there anything else you can do by yourself or with a practitioner? 1:04:35 Can gut health affect your mood? 1:08:00 How important are probiotics? Can I take probiotic capsules everyday or is it a waste of money? Should healthy people be taking these supplements? 1:14:35 What happens to gut health and an autoimmune condition if you've had your thyroid taken out? 1:15:55 If you have a funny tummy or an unpredictable stomach, what are some things you can do to neutralize stomach acids? 1:17:20 Digestive enzymes are really big in the Keto world, but are they necessary? 1:18:10 If you already eat a balanced diet, do you need to supplement gut health with anything? Are gut detox health packages worth it? Check out last week's episode - OSF 162 - Barefoot vs Arch Support Shoes: Which One is Better? Thanks for listening/reading Episode 163 with Dr. Michael Ruscio: Gut Health: Healing Autoimmune Disease! We hope you have gained more knowledge on how to be a healthier you. Why Barefoot or Arch Support Shoes? On today's episode of the Open Sky Fitness Podcast, Devon and I are tackling the ultimate clothing question: Is it better to walk or exercise while wearing barefoot, minimal shoes are shoes with tons of arch support? Either way, why did we even begin to wear shoes in the first place and what makes barefoot or arch support shoes so important to our foot's health? Sometimes a pair of shoes that has good arch support isn't necessarily the best purchase choice for everyone. The first shoes were introduced when our ancestors created Moccasins. Made out of animal hide, these shoes were meant to protect our feet from the outside elements. Since then, so many different types of shoes have been marketed to our desires. Shoes for perfect alignment, to improve our bodies appearance (I'm looking at you Skechers Shape Ups which have no beneficial value), or for work. Unfortunately, there's no magic shoe that can help our bodies. We have to work on our own to strengthen our feet and body. A soft toebox with lots of padding is supposed to help improve comfort and shock absorption. A heel lift in the back of the shoe is meant to help align the body. For those who need it, the arch support is meant to help weak arches and to help keep the integrity of the arch. If the toe box is too narrow, then it won't allow for the expansion of the feet. Your feet shouldn't be crammed in your shoe. Instead, you should be able to comfortably open and close them. The toe box might also be too soft and therefore it doesn't support the arch of the foot. When a shoe has an excess amount of arch support, it simply makes the foot lazy and weakens the arch. It keeps your foot in one position instead of allowing it to flex and move. Shoes with poor designs can also negatively affect our bodies. By constantly wearing shoes with little support such as flip flops, sandals, wedges with no heel back, or heelless shoes can harm the foot's health if they're worn regularly for long periods of time. In fact, these shoes change how we walk because we need to clench our toes to grip the shoe. Each step forces us to change our feet to be in a fixed, improper position. Barefoot shoes like Vibrams and other minimalist shoes offer zero to minimal padding so that you have full contact with the ground. There's just some rubber and a bit of fabric that makes up the bottom of the shoe for comfort. 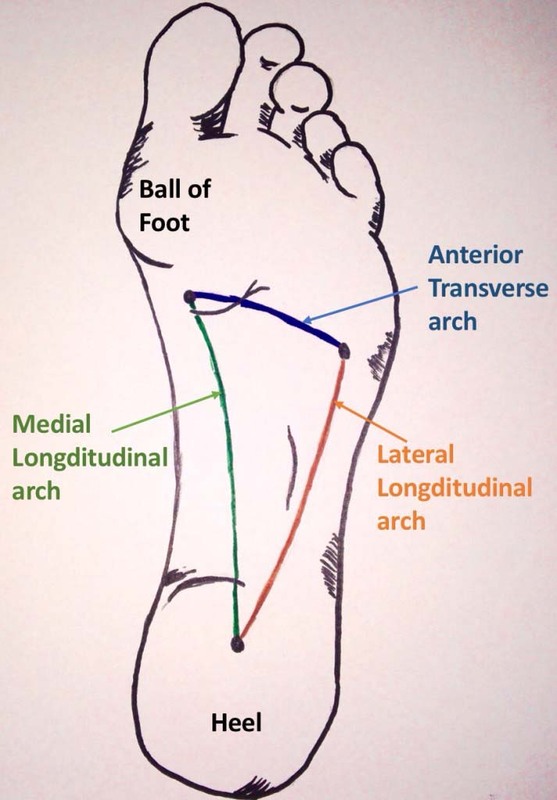 This allows for all of the muscles in the foot to stay engaged and therefore it for forces the arch muscles to stay active. By relying on your feet to balance your entire body, you also become fully aligned and don't have to solely rely on the shoe to help stabilize you. However, you have to take it very easy when wearing barefoot shoes for the first time. Unlike regular shoes, there is no heel cushion which forces the wearer to strike on the ball of their feet when they walk or run. These can easily harm the foot if a person doesn't change their gait. 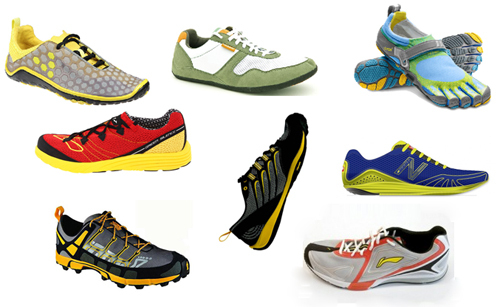 We can't stress it enough, but it's vital to have a slow transition to wearing barefoot shoes. You don't want to wear them all day or to go for a hike when you first wear them because your feet and calves will be in so much pain the next day. Instead, start by wearing the shoes for short periods of time. If you want to run with them, practice with a walk-run routine for 5-10 minutes by walking with them for 5 minutes, 1 minute jogging and so on. Nike Free has more padding and a bit softer and is a great transition shoe for full range of motion and wear those for 6 months to get used to them and THEN start that process over again with minimalist shoes. Make a slow transition and be smart about it as well as patient. The main reason why some people need to wear shoes with arch support is because it picks up the slack for our feet's weaknesses. Many doctors will also say that it can help our body's alignment and improve pain management. However, the external support can create weakness and muscle atrophy because you're not allowing your foot to do its job to support the body. We can heal our feet by focusing on opening and strengthening the muscles. Some easy tools can include a foam roller as well as a lacrosse or tennis balls to help roll out your foot and relax the muscles. Golf balls are also great to stretch out individual toes. We also recommend practicing toe articulation and calf raises regularly. The Yamuna foot wakers and and TheraBand products are also great to use whenever you experience aches and pain in your feet. 1:30 Check out last week's episode -OSF 161 Joe Stout: Goat's Milk vs Cow's Milk - Which is Better? 2:20 About today's episode on barefoot running shoes vs traditional arch support running shoes. 7:35 What is an arch? 9:50 Why do we conventionally believe that we need shoes with good arch support? 15:00 Our feet's connection with the rest of our body from walking to jumping. 44:20 The problem with how some shoe designs can negatively affect our bodies. 47:55 What do shoes provide and why do we even wear them in the first place? 52:00 Why and how to strengthen your feet. 57:30 How do we transition into barefoot shoes? 1:08:45 How to heal your foot problems. Check out last week's episode - OSF 161 Joe Stout: Goat's Milk vs Cow's Milk - Which is Better? Thanks for listening/reading Episode 162 - Barefoot vs Arch Support Shoes: Which is Better? We hope you have gained more knowledge on how to be a healthier you. How Mt. Capra runs their goat farm and what they're doing to make it more sustainable. In the sense of casein and milk allergens, which is better cow's or goat's milk? Lactose intolerance vary with different dairy products and what causes it to happen. How Joe and his team at Mt. Capra fed their goats during the winter before using the hydroponic barley fodder system. When it comes to cow's milk vs goat's milk. One thing to keep in mind is how each is consumed on a global scale. Goat's are much more economic; especially in third world conditions plus they have lots of nutrients and their milk is easier to digest than cow's milk. In fact, many people, especially children, are allergic to cow's milk. It's actually the no. 1 allergen for children under three years old. This week in our Open Sky Fitness Facebook Group, we had a great question come up. What are some potential milk alternatives for coffee, cereal, protein shakes, and smoothies? First of all, we don't recommend anything like Coffee Mate or International Delight because they're not whole, healthy, nutritious alternatives to actual milk. Drain the cashews, discard the soaking liquid, and rinse the cashews. Using a high - speed blender, place the cashews or almonds in the blender and start with the lowest speed and work your way up to the highest speed until creamy. It takes about 2 minutes to completely blend the cashews. To sweeten the coffee creamer, just add either raw maple syrup or raw honey with a couple of drops of vanilla extract. Joe received a Masters of Science in Clinical Human Nutrition from the University of Bridgeport and a Bachelors of Science in Human Nutrition and Food Science from Washington State University. Along with running the farm, He has engaged in graduate studies of Sustainable Food Systems at Green Mountain College and is certified in Permaculture Design. Joe and his wonderful bride Elizabeth have been married for 10 years and have been blessed with 6 beautiful children. Each Thursday night at 7:15pm PST via the closed Open Sky Fitness Facebook Group , Devon and I will be online to answer an questions you may have about health, wellness, fitness, nutrition, lifestyle etc. Ask us anything! 6:20 What are some milk alternatives for coffee, cereal, protein shakes, and smoothies? 20:00 How Mt. Capra makes their mineral whey product. 25:55 What's the process to turn whey into a powder form? 30:25 Why is the mineral, silica or silica dioxide, added and what are its benefits? 34:30 Some of Joe's crazy goat stories and why you should be careful if you decide to own a goat. 41:00 How Mt. Capra runs their goat farm and what they're doing to make it more sustainable. 42:50 What's more popular on a global scale: cow or goat's milk? 44:15 In the sense of casein and milk allergens, which is better cow's or goat's milk? 47:00 Lactose intolerance vary with different dairy products and what causes it to happen. 52:00 What's the difference between concentrated and isolated whey products. Why does one create a reaction, but the other doesn't? 54:35 How do cow's milk and goat's milk compare as far as minerals? 58:00 About Hydroponic Barley Fodder to feed goats for sustainable farming and healthy animals..
1:01:00 The importance of sustainable farming and regenerating the land. 1:03:50 How Joe and his team at Mt. Capra fed their goats during the winter before using the hydroponic barley fodder system? 1:08:55 A look at the various products that Mt. Capra creates and sells in their stores and online. Check out OSF 157 Milk: Why Do We Even Need It? Find out what Paleo FX is all about! Thanks for listening/reading Episode 161 with Joe Stout - Goat's Milk vs Cow's Milk: Which Is Better? We hope you have gained more knowledge on how to be a healthier you. 3 spots left for One-on-One Coaching with Rob and Devon! Click here to apply today by Thursday, August 3! Read our episode show notes here! This week's episode is all about metabolism and how it affects our ability to lose weight. Many people believe that we can burn calories and get fit based on the old-fashioned energy in, energy out model. However, there's so much more to living a healthy lifestyle than just that and metabolism plays a huge part in it. "I think I have a broken metabolism." "You can't change your metabolic rate." "Eating at night slows down your metabolism." "Low-calorie diets can jump start your metabolism." "Your metabolism is fixed for life whether that's good or bad." If you eat less and move more, you'll be fine, but why are you hitting a plateau if that's true? There are so many other factors involved in metabolism and weight loss or gain. Basal metabolic rate (BMR) or resting metabolic rate (RMR) is how your body converts energy and food at rest. The amount of calories that we absorb depends on what food we eat. If we eat whole foods that are unprocessed, we'll absorb less than if we were to eat processed foods. The USDA is able to have a 20-25% range of amount of calories they put on the nutrition labels. So, it's easy to be way off on how much we're actually consuming every day. We could be eating 20% more or less than what's actually stated on the label. Body composition: How much is fat, muscle, and bone plus your muscle requires more energy to stabilize and sustain. Aging: As you age, you tend to lose muscle mass. Gender: Men typically burn more than women. Hormones: Thyroid, low testosterone, insulin & insulin resistance. Caffeine and nicotine can increase RMR but only if you take them all day can it be bad for you. Anything that speeds up your heart rate will affect your metabolism, but it's not a healthy choice. Pharmaceutical drugs - speed based drugs can increase metabolism. Can completely decrease the RMR and there can be other side effects. Adding muscle can increase your rate for long-term because it changes your body composition. Muscle burns more than fat when the body is resting. So the more muscle mass you put on, the more muscle you'll burn. Cardio helps to burn a lot of calories in the moment, but it doesn't affect the metabolic rate in the long-term. A ton of cardio can actually stress out the body by changing your cortisol levels which keeps fat on and it burns muscle mass. A little bit of cardio can be beneficial but too much causes issues for the long-term. Spend a couple of days a week weight training or include it into your weekly circuit workout at the gym if you add some cardio. Our gut bacteria is also important factor as far as our ability to digest food and absorb nutrients. Depending on the type and amount of gut bacteria that we have in our microbiomes, we can absorb more or less food. When you lose a lot of weight, your metabolism slows down and could stay that way for a long time or for live. Rather than focusing on low-calorie diets and intense cardio training that will burn both fat AND muscle mass, focus on portion sizes and eating whole foods such as protein. Don't even pay attention to nutrition labels or calories. Just focus on eating good portions of whole foods like meat, vegetables, fruit, and healthy grains. The more whole the food is, the more energy your body needs to consume and process the food. Non- Exercise Activity Thermogensis aka NEAT happens if you're fidgety and need to stand all day, pace, or walk around a lot all day because you simply can't stay still. Do you walk around a lot for work? Different jobs can affect this. If you're walking around all day, you're going to burn more calories compared to someone who has a desk job or sits on the couch all day. If you sit all day at a desk job, then you're not able to access your NEAT. Get up to go for a walk a couple of times a day or get a stand-up desk. Sleep is recovery and healing for the body. It's better to sleep more than only sleep for 4 hours and get up early to go workout. Make sure you're giving your body and mind plenty of rest throughout the week. On the other hand, sociliazing can also boost your body as well as positive thinking. In return, this can help your metabolism as well. Go spend time with friends and family to further help you unwind and relax. Pets like a dog can also be great because then you'll have something to look after and take care of 24/7 who'll give you attention in return. 2:15 Today's topic - Metabolism! 12:00 How cooking and processing foods can affect how much calories we actually absorb. 14:20 Why our gut bacteria affects our calorie intake. 33:20 The energy out part of exercise. Learn more about calories with OSF 133 - Should I Count Calories? Why or why not? Thanks for listening/reading Episode 160 - Metabolism: How It Impacts Your Weight Loss! We hope you have gained more knowledge on how to be a healthier you.